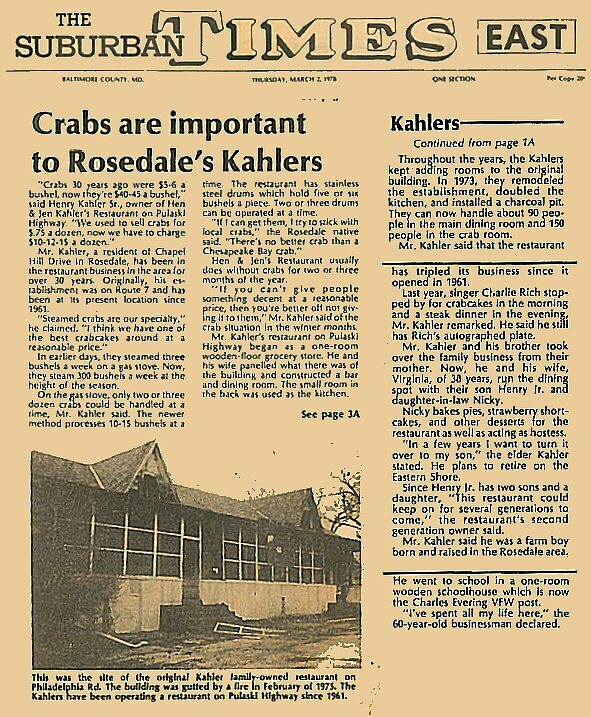 The Kahler family has been preparing seafood in the Rosedale area since the 1940's and we still hold the old traditional values of good quality food and great service, just like your grandparents expected and received! Our recipes are proven favorites and we still insist on the same quality ingredients that we used two generations ago. Our commercial watermen collects crabs and other seafood directly from the Chesapeake Bay and transport them quickly to Kahler's kitchen where meals are fresh-cooked to order! Now we've added some new favorites to the mix! While seafood is still our specialty, we now offer traditional American fair for the members of your party that prefer other choices. Our burgers and chicken are made to the same quality standards as our seafood. And don't forget to try our new home made ice cream, made fresh right on the premises!! "Crabs 30 years ago were $5-6 a bushel, now they're $40-45 a bushel," said Henry Kahler Sr., owner of Hen & Jen Kahler's Restaurant on Pulaski Highway. "We used to sell crabs for $.75 a dozen, now we have to charge $10-12-15 a dozen." Mr. Kahler, a resident of Chapel Hill Drive in Rosedale, has been in the restaurant business in the area for over 30 years. Originally, his es-tablishment was on Route 7 and has been at its present location since 1961. "Steamed crabs are our specialty," he claimed. "I think we have one of the best crabcakes around at a reasonable price." In earlier days, they steamed three bushels a week on a gas stove. Now, they steam 300 bushels a week at the height of the season. On the gas stove, only two or three dozen crabs could be handled at a time Mr. Kahler said. The newer method processes 10-15 bushels at a time. Tlie restaurant has stainless steel drums which hold five or six bushels a piece. Two or three drums can be operated at a time. "If I can get them, I try to stick with local crabs," the Rosedale native said. "There's no better crab than a Chesapeake Bay crab." Hen & Jen's Restaurant usually does without crabs for two or three months of the year. "If you can't give people something decent at a reasonable price, then you're better off not giving it to them," Mr. Kahier said of the crab situation in the winter months. Mr. Kahler's restaurant on Pulaski Highway began as a one-room wooden-floor grocery store. He and his wife panelled what there was of the building and constructed a bar and dining room. The small room in the back was used as the kitchen. Throughout the years, the Kahlers kept adding rooms to the original building. In 1973, they remodeled the establishment, doubled the kitchen, and installed a charcoal pit. They can now handle about 90 peo-ple in the main dining room and 150 people in the crab room. Mr. Kahler said that the restaurant has tripled its business since it opened in 1961. Last year, singer Charlie Rich stopped by for crabcakes in the morning and a steak dinner in the evening, Mr. Kahler remarked. He said he still has Rich's autographed plate. Mr. Kahler and his brother took over the family business from their mother. Now, he and his wife, Virginia, of 38 years, run the dining spot with their son Henry Jr. and daughter-in-law Nicky. Nicky bakes pies, strawberry short-cakes, and other desserts for the restaurant as well as acting as hostess. "In a few years I want to turn it over to my son," the elder Kahler stated. He plans to retire on the Eastern Shore. Since Henry Jr. has two sons and a daughter, "This restaurant could keep on for several generations to come," the restaurant's second generation owner said. Mr. Kahler said he was a farm boy born and raised in the Rosedale area. He went to school in a one-room wooden schoolhouse which is now the Charles Evering VFW post. "I've spent all my life here," the 60-year-old businessman declared.